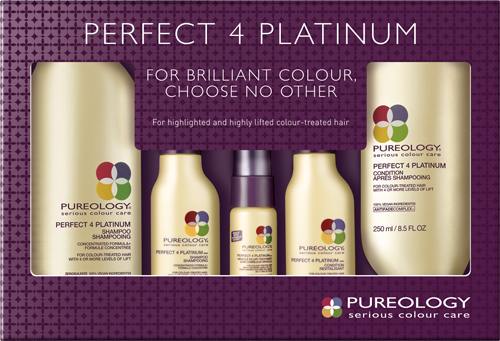 Just in time for summer, Pureology, the pioneer in ZeroSulfate® shampoos, introduces a new promotion featuring the award-winning Perfect4Platinum system. The summer sun can wreak havoc on fragile strands, especially those that are highlighted and highly lifted. The Perfect4Platinum system repairs, strengthens and softens to help hair retain its fresh-from-the-salon vibrancy. Beginning in June in salons nationwide, Pureology will offer the ‘Perfect4Platinum Brilliant Shine Kit’ and will make a $20,000 donation to support Global Green USA in conjunction with this promotion. Help fragile, highlighted and highly lifted hair retain its fresh-from-the-salon vibrancy with Perfect4Platinum ZeroSulfate® shampoo and the exclusive AntiFadeComplex®. Key ingredients include: Strengthening Technology with protein-rich Keravis, softening plant extract of chamomile, brightening plant extract of lemon, nourishing plant extract of coriander. 100% recyclable bottles feature the latest FDA-approved, 50% post-consumer recycled High-density polyethylene (HDPE) materials for unparalleled safety and environmental sustainability. – Giving back is one of Pureology’s core values and this year, timed with the above promotion in which Pureology is donating $20,000 to Global Green USA, Pureology has launched its Crowdrise Fundraising page for Global Green USA for its community to get involved and support Global Green USA! The power of the crowd is real, small donations really do add up to make a monumental impact on our environment. Thanks to the donations and funds raised by Pureology and its community, Global Green USA continues to focus on greening our nation’s schools, educating on water conservation, and improving the quality of life for people and their communities by fostering environmental awareness about the health and future of our planet. Visit Pureology’s Crowdrise Fundraising page for Global Green USA to make your donation today! As a brand with a sustainable vision, Pureology continually works to reduce its environmental impacts through efficient production and manufacturing processes and by incorporating more environmentally preferred materials. This year, Pureology announces that recent improvements to its Shampoo and Condition packaging, such as the NEW Zero Waste packaging, are helping reduce its environmental impacts. – 100% recyclable bottles feature the latest FDA-approved, 50% post-consumer recycled high-density polyethylene (HDPE) materials for unparalleled safety and environmental sustainability. – For secondary packaging, Pureology decreased the amount of cardboard and uses Forest Stewardship Council (FSC) certified cardboard boxes made from 100% recycled fibers. Pureology also added educational messages to these boxes, reminding purchasers to recycle the box and providing tips on how they can conserve water.